WALTHAM, MA -- (MARKET WIRE) -- November 7, 2005 -- Liquid Machines®, Inc., the leading provider of Enterprise Rights Management (ERM) solutions, today announced it has shipped its Liquid Machines BlackBerry Gateway™ for Microsoft Windows Rights Management Services (RMS) for Windows Server 2003. The new Liquid Machines BlackBerry Gateway extends Windows RMS secure-messaging capabilities to the BlackBerry® wireless platform, allowing enterprise BlackBerry Wireless Handheld™ users to send and receive RMS-protected messages from their wireless devices. Windows RMS is information protection technology that works with Microsoft Office 2003 applications to help safeguard digital information from unauthorized use. Liquid Machines enhances Windows RMS with server-side policy enforcement capabilities that automatically apply message protection based on corporate guidelines at the email gateway. Liquid Machines BlackBerry Gateway for RMS extends corporate email access and usage policies to BlackBerry Wireless handhelds to ensure consistent, enterprise-defined RMS protection across the extended enterprise. "BlackBerry continues to be the leading wireless data platform for enterprise and government organizations around the world," said Ed Gaudet, vice president of product management and marketing at Liquid Machines, Inc. "Liquid Machines BlackBerry Gateway for RMS extends messaging security to a customer's mobile workforce -- helping users maximize productivity while maintaining information control and increasing a customer's return on their Windows RMS and BlackBerry investments." "Customers have told us that regulations and competitive pressures are forcing them to increase the safeguards around their sensitive information. At the same time, accessibility from mobile devices has become a vital component of many customers' information infrastructures," said John Chirapurath, director in Enterprise Access and Security Products Product Management at Microsoft Corp. "We are pleased that Liquid Machines has delivered a solution that further enhances these customers' corporate governance and compliance objectives by extending the RMS platform to BlackBerry." "Increasingly, information protection and data security projects are taking precedence on customers' IT agendas. The first question many customers ask is about persistent protection of intellectual property, the second is how they can lock down emails sent to BlackBerry handhelds," said Kurt Hetzel, Consulting & Integration -- Microsoft Security, HP. "Liquid Machines BlackBerry Gateway for RMS addresses these common criteria among enterprise customers with a solution that allows them to control email messages and attachments and eliminates the data leakage threat posed by BlackBerry devices." Using Liquid Machines BlackBerry Gateway for RMS, enterprise BlackBerry users are able to read messages governed by Windows RMS confidentiality and retention policies. Additionally, Liquid Machines BlackBerry client integrates seamlessly with the BlackBerry user interface to allow users to easily compose and exchange RMS-protected emails with suppliers, customers, and partners. RMS policies can be applied by the BlackBerry user or can be enforced automatically at the email gateway based on the message recipient, subject, and content. All usage of a secured message is logged, and even unsuccessful attempted actions are recorded for auditing purposes. Join Stuart E. Goodnick, Liquid Machines Vice President of Professional Services and Support, on Tuesday, November 15, 2005 at 4 p.m. ET for "Windows RMS & BlackBerry: Secure Enterprise Messaging for the Mobile Workforce" -- a live online seminar and demonstration of Liquid Machines BlackBerry Gateway for RMS. The presentation will be followed by an attendee Q&A session. Register for this online seminar at: http://www.liquidmachines.com/contentmgr/showdetails.php/id/846/num/1. The Liquid Machines BlackBerry Gateway for RMS is available immediately. Each of Liquid Machines BlackBerry Gateway solutions supports version 3.6 and 4.0 of the BlackBerry Enterprise Server. Liquid Machines is offering special promotional pricing for Liquid Machines BlackBerry Gateway and its other RMS products to all customers holding a Microsoft Enterprise License Agreement. For more information, contact Liquid Machines at: 1-877-88-LIQUID/1-781-693-3688 or info@liquidmachines.com. Liquid Machines is the leading provider of Enterprise Rights Management (ERM) solutions that persistently protect critical business content and audit usage while enabling collaboration. Liquid Machines' Document Control and Email Control solutions allow companies in the consulting, financial services, government, manufacturing, and healthcare industries to share information securely, within any application, wherever it goes, throughout its lifecycle. Liquid Machines ERM solutions help enterprises satisfy today's ever-increasing information security regulations such as Sarbanes-Oxley, NASD 2711, HIPAA and others, as well as implement and practice internal mandates for intellectual property security, product version control, or clinical data protection. Based in Waltham, Massachusetts, Liquid Machines is privately held and is backed by Atlas Venture, Masthead Venture Partners, and Draper Fisher Jurvetson. For more information on the company and our vision The Freedom of Security™, visit us at www.liquidmachines.com. © 2005 Liquid Machines, Inc. All rights reserved. Liquid Machines, Enabling Secure Business, The Freedom of Security, Policy Droplet, Omniva, and the Liquid Machines logo are trademarks or registered trademarks of Liquid Machines, Inc. Research in Motion, RIM, and BlackBerry are trademarks of Research in Motion Limited. Research in Motion and RIM are registered with the U.S. Patent and Trademark Office and may be pending or registered in other countries. Microsoft and Windows are registered trademarks of Microsoft Corp. in the United States and/or other countries. Product or company names mentioned herein may be the trademarks of their respective owners. The information contained in this document represents the current view of Liquid Machines, Inc. on the issues discussed as of the date of publication. About this company Liquid Machines, Inc. 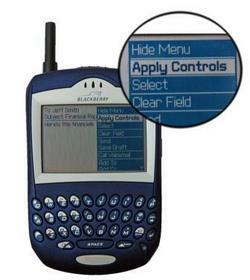 Liquid Machines BlackBerry Gateway<br>for RMS seamlessly integrates with<br>BlackBerry wireless handhelds to<br>make sending and expiring<br>confidential messages easy from<br>the BlackBerry menu.